KING of the Assists is a particularly apt title for one Hearts winger. Billy King created a total of 13 goals this season and added nine strikes of his own for good measure. No other Tynecastle player opened up defences as often, although King is already seeking to improve on both fronts. 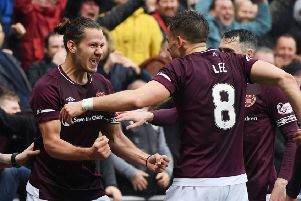 He has just signed a new two-year contract as Hearts prepare to step up to the Scottish Premiership after romping to the Championship title. King knows the level will be far more intense. He is determined to learn from the best and do even more damage next season – despite setting up more goals than any of his colleagues over the last ten months. Chelsea’s Eden Hazard and Marco Reus of Borussia Dortmund are just two of the European superstars he studies closely. Being able to create and score are vital functions for a modern attacker and King values both commodities hugely. “As a wide player, I want to influence games. And games depend on assists and goals,” said King. “These are what decide results so that’s nice if I’m top of the assists list. Goals are good as well but next season I’ll be looking to improve on the goals tally. “When I started to get a run in the team towards the end of last season, I started to get a few goals and a few assists. When I go into a game, that’s what I’m thinking. ‘How can I affect the game? Can I provide an assist or score myself?’ It’s nice to have a good amount of assists and goals this season and I want to kick on next year. The competitive nature of this season’s Hearts squad means no accolade goes without a challenge. Goals are the most valued prize, therefore King’s assists are vital. “The goals chart has been really competitive,” he continued. “Osman [Sow], Genero [Zeefuik], [James] Keatings and [Jamie] Walker were all up there. The desire to improve continues during the close season when King will volunteer for extra training. He is recovering from ankle surgery just now and intends to join in sessions Hearts coaching staff have planned for young players to work on strength and conditioning. “Yeah, I will do that,” he said. “They will be in Mondays, Wednesdays and Fridays. It is voluntary for all the first-team players, it’s just the younger players who have to come in. I will be in to do rehab anyway so I will join in the gym sessions as well. It is sometimes easy to forget King is only 20, and as such susceptible to the confidence issues which affect every young footballer. He has been around the Tynecastle first-team squad since late 2012 and is only a dozen games off his 100th competitive appearance. As yet, he hasn’t managed to command a starting place week in and week out over a sustained period, which makes his King of the Assists title all the more impressive. He is willing to remain patient, conscious that time is on his side and he is learning from regular first-team outings. He already has 18 months experience of Scotland’s top flight having made his senior debut back in January 2013 under the former Hearts manager John McGlynn. The ensuing two-and-a-half years showed glimpses of a player with the potential to excite fans. “The manager [Robbie Neilson] has had a lot of belief in me and that’s good to have,” he said. “I think I’ve had a decent season in terms of goals and assists but I’ve also got more to offer. Next season, I’ll be looking to develop even more and build on this year. With younger brother Adam still playing under-21 football at Swansea, King is confident he is in the best environment to progress. “Adam chose to go to Swansea and I speak to him all the time. He’s really enjoying it there and feels it’s improved him as a player because there’s good coaching. Up here, you’re playing first-team football whereas he’s just playing under-21s. There are pros and cons to both. Even Neilson’s double and triple training sessions haven’t put him off despite initial doubts. “I think when it was first introduced there were a few players who might have been thinking that, but now everyone has bought into it,” said King. “Once you have done it for even a couple of months you are just used to it. We have done it for a whole season and I just think that’s the right way to do it. Hearts players now have Mondays off.